College isn’t just about studying specific subjects. In college you also learn more about yourself and what interests you. And you learn what doors of opportunity are waiting to be opened by someone just like you. If you’re not sure about what you want to do or what opportunities are available to you, you’re not alone. Most kids aren’t sure. That includes college kids, too. Learning about your career opportunities is one important way that college can be helpful to you. You don’t have to know exactly what you want to be right now. It’s more important for you to understand some basic things about careers. Some careers require a college education, but others do not. If you want to be an architect, you must complete college. Running your own business may not require you to have a college education, but the college courses you take can improve your chances of success. For many careers, college is just the beginning. For example, to be a lawyer, you must first go to college and then to law school. To be a doctor, you have to go to medical school after college. You can enter other careers with different levels of education. And various jobs within career fields may require different amounts of education. For example, to be a school teacher, you must be a college graduate. Most school teachers continue their studies after college. To be a principal or a college professor, however, you must have advanced studies beyond college. 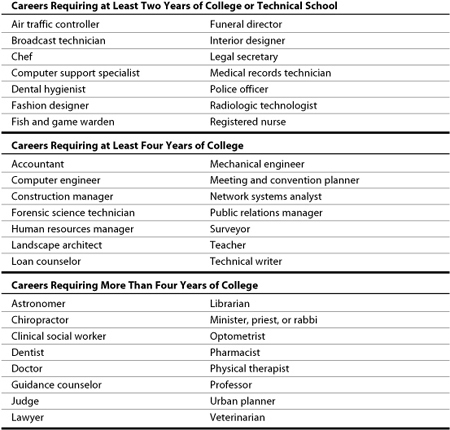 The following chart gives more examples of careers and the education you need to prepare for them. Many occupations require you to be licensed by the state—to go through a formal process in which the state grants you permission to work in the field. Licenses or certification may be required in such diverse fields as teaching, nursing, social work, law, plumbing, insurance, medicine, real estate, and counseling. The amount of education you need is not the only thing that differs from one career to another. Some careers, such as those in business and engineering, require specific skills. You will also need to take specific courses to develop these skills. Other careers have less specific requirements. You can enter them with a broader range of courses and skills. For example, if you go into sales, you might have a background in business, economics, liberal arts, or communications. If you want a career in a helping profession such as social work, you could have a background in education, medicine, or social sciences. Learning what people in a career really do, and what education and skills they need, is important for planning your future. The images we have of careers are not always accurate. We often get our sense from the movies, television, or the news. For instance, most people’s image of the Federal Bureau of Investigation (FBI) is shaped by action films and television programs featuring undercover agents in dangerous, high-speed chase situations. Would it surprise you, therefore, to know that the FBI is especially interested in hiring people who have studied accounting, science, computers, foreign languages, and art? People with these backgrounds are often able to do the behind-the-scenes work that not only helps catch criminals, but also helps make sure they are convicted. For example, an accounting background helps you research tax and business records to discover wrongdoing. Scientists perform laboratory work such as DNA analysis to study evidence, and artists help re-create crime scenes. Popular television series such as CSI (Crime Scene Investigation) have brought attention to the scientists who work with police forces to solve crimes.